Rising UFC star Jon Jones has been pegged by many as the next great fighter and so far in his young MMA career, he’s lived up to the hype. 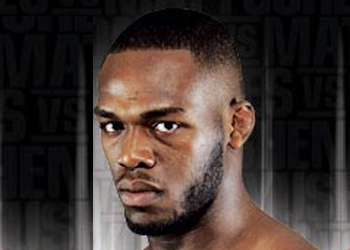 Jones has even talked about the possibility of making a jump up in weight to compete against the Octagon’s big boys. After winning four of his first five bouts in the UFC, Jones could find himself right in the middle of the 205-pound title picture. Although, Mother Nature could have an affect on his future as well. “This training camp has been really tough for me. I actually got up to about 231 (pounds) for the first time and I’m 23,” Jones continued. Cutting weight hasn’t hindered Jones’ in-cage performances as of yet, but a move up to heavyweight could definitely be in the cards. If “Bones” did make the move, he’d consider doing what UFC Hall of Famer Randy Couture did during his heyday. “I’m always looking for a challenge. Randy Couture does it, moving up and down in weight classes and it’s not something I’d be opposed to,” explained Jones. Next up for the Greg Jackson trained fighter is an important light heavyweight bout with Vladimir Matyushenko at UFC on Versus 2 on August 1st.